I have been using PDF Converter Professional 8 from Nuance Communications, Inc., to create and modify PDF files. Functionally, the program is nearly equivalent to Adobe Acrobat, and the price was considerably more attractive. 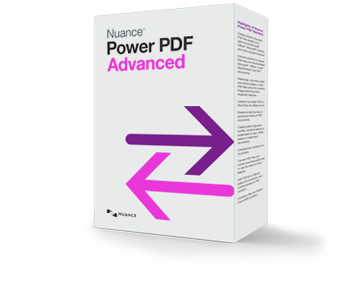 Recently, Nuance began advertising their latest PDF product, Power PDF Advanced, claiming that it is a significant advance over the earlier product. In large measure, PDF Converter Professional 8 was meeting my needs, but the new product did offer some capabilities that seemed like they might occasionally be useful. With some reservations, I decided to order the new software. In due time, the program was installed and, seemingly, registered and activated. It appeared to be working fine, though I was having trouble locating functions I regularly used in PDF Converter Professional 8. Then I used Power PDF Advanced to change document properties of a PDF file produced by Word 2010. I was shocked to discover that the file now contained a watermark indicating that it had been produced by a trial version of the software. My immediate thought was that activation had not been done properly, but the About window showed my name and product serial number. I quickly realized that I did not know what the problem was. Moreover, the time was about 7:45 PM, and Nuance technical support closed up shop at 8:00 PM. I made a telephone call to Nuance in the hope of solving my problem before the Fourth of July holiday and weekend. Thinking that my problem was an activation problem, I pressed the appropriate buttons on my telephone to indicate that to the phone system. Instead of technical support, I reached customer support. That office was closed, but I did get to talk to a real person. I described my problem and was told that it was a known problem. The real person suggested I call the technical support number—that was the actual number I did call—and explained that I should press “1,” rather than “2” at the initial prompt. I did that, and in fact reached someone in technical support. The technical support person—for convenience, I’ll call him Bob—was also aware of the problem. He first checked registration and activation. Apparently, the product was not properly registered or activated, but Bob was able to fix this once I gave him the product’s serial number. This did not fix my problem, however. We proceeded to apply a workaround intended to fix the problem. It didn’t work. Forty-five minutes later, having used the Windows Task Manager a couple of times and rebooted the computer, the problem remained. I suggested that a product should never have been let out the door with a problem like the one I was encountering; Power PDF Advanced is unusable. I asked, “Do you test your software? Does technical support have to deal with this problem with every user?” Bob assured that not everyone had the problem and that the software people were working on a fix. Apparently, however, Nuance has no idea what is causing the problem. I was asked to download the Microsoft Process Monitor and upload a log file to Nuance. I countered that I should be paid for debugging their software. Stay tuned. I’ll report how this turns out. Meanwhile, if you’re considering buying Power PDF Advanced, I’d hold off for now. Update, 7/4/2014, 9:10 AM. After I wrote the above, I thought that perhaps the problem had gone away. 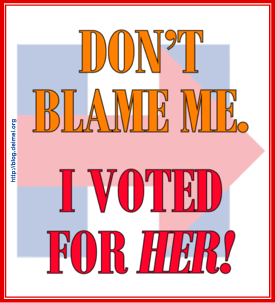 Unfortunately, that was not the case. The offending watermark appears in some circumstances but not in others. I have not figured out which is which. Update, 7/4/2014, 11:45 AM. I downloaded Process Monitor and started it, reproduced the problem, stopped the Process Monitor, saved the log file, compressed the log file, renamed it, uploaded it to an ftp site, and sent e-mail to Nuance. We’ll see what happens next. This isn’t exactly how I meant to spend Independence Day. Update, 7/4/2014, 12:37 PM. I received a request from Nuance a little while ago for information about my system from the System Information application. That has now been sent. Back to waiting for a fix. Actually, I have to be impressed that someone is working on my problem on July 4. I now seem unable to reproduce the problem. I tried creating PDF files from various sources. In particular, using the Nuance Create PDF Word Addin does not yield a document with the offending watermark. I am reluctant to conclude that the problem has gone away. What has changed? Any ideas? Update, 7/8/2014, 2:26 PM. I received another message like the last one: “We are continuing to work on your issue. If you have more information, update your question here:” (This whole sentence was a link.) Nuance also sent a Word file explaining how to remove a Trial watermark. This document ended with this depressing piece of information: “Unfortunately, this is a page by page process, so to clean up a large document you have to do this on every page to clean up an entire document.” Happily, I have not created any long documents with the offending watermark. Update, 7/11/2014, 4:00 PM. I haven’t heard anything more from Nuance. After I rebooted my computer today, however, I saw a window requesting that I register the software. When I logged into the Nuance site, I found that it already listed my software as registered. (Note that I redacted the serial numbers in the image using a feature of Power PDF Advanced.) Anyway, I reported the anomaly to Nuance. Update, 7/14/2014, 9:18 AM. Although I thought that the watermark problem might have gone away, it showed up on a page printed from Chrome this morning. I created a PDF file using the Print This button at the bottom of this page. (You can see the resulting file here.) I wrote Nuance about this. I haven’t heard from Nuance since 7/6. Update, 7/14/2014, 9:32 AM. 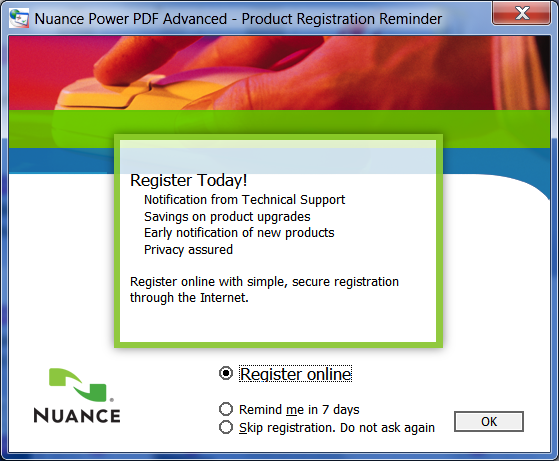 Just after I wrote Nuance, a popup window informed me of an update to Power PDF Advanced. I installed the hotfix and tried to recreate the problem noted above. The watermark did not appear. I have now written Nuance to ask if the hotfix is intended as a total fix for the problem. Update, 7/14/2014, 11:09 AM. I received e-mail from Nuance stating that the hotfix is supposed to resolve the problem of the errant watermarks. Nuance has closed the incident. 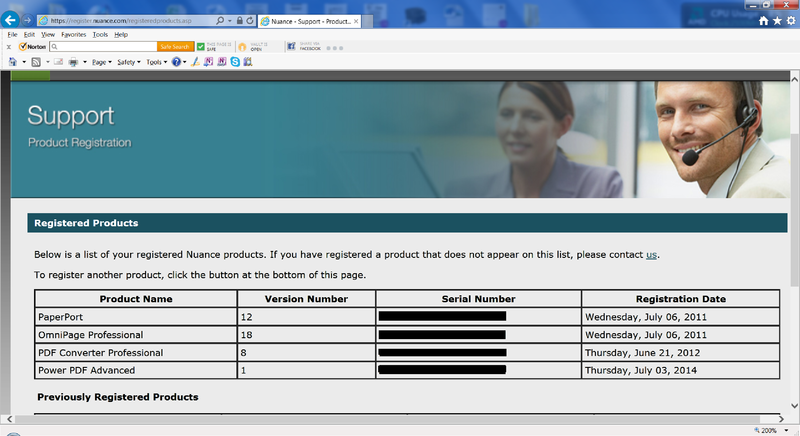 From all I can tell, the bug in Nuance Power PDF Advanced has indeed been fixed, eleven days after I reported it. Clearly, however, I was not the first to notice the problem, so I don’t know just how long it took Nuance to track down and fix the bug. My needs may be simpler, but I use Open Office and its save as pdf function for what I want and it works fine and is Open Source so I do not pay. Of course if I get in trouble (moi???) there is no tech support number. On the other hand the online community is amazing. I shall follow your adventure with interest. I too enjoyed the software up to version 7 and was excited about what they might do with this new version considering the exorbitant cost. They effing RUINED it. Can't even enjoy the free trial without that RIDICULOUS watermark which makes the trial USELESS. I hope they burn for a thousand years on the Lake of Software Idiocy and all go hungry for their crimes against us document manipulators. Purely out of spite I'm going to d/l an illegal copy and distribute it across the land - version 7 of course so at least it'll be usable. What kind of asshat would make this mistake?? If you want a high quality timesheet reporter to keep track of all your professional timings, click here to get more info about it.